Oral leukoplakia is a pre-cancerous condition affecting the delicate tissue inside the mouth. It is seen as white patches on the oral mucous membrane that can not be scraped off. The lesion is said to be of leukoplakia only after all the other possible lesions which have a similar appearance are ruled out. It is often associated with tobacco usage and if untreated has a potential to turn in to oral cancer. Leukoplakia can also be present other parts of lining membranes of the body, such as mucous membrane of gastrointestinal tract and urinary tract. However, it is when it occurs inside the mouth that it is more easily noticed. Although not a common condition, oral leukoplakia is more often seen in people over the age of 40 years and in seniors. Oral leukoplakia is not the same as oral thrush (candidiasis). The latter is due to a fungal growth especially on the tongue and is more frequently seen in diabetics and people living with HIV. Oral thrush has a more yellowish white appearance and can be scraped off to some degree but does look very similar to oral leukoplakia. The most common sites for the oral leukoplakia lesions to develop are inner part of the lips, cheek mucous membrane, lip, tongue, palate and gums in the same order of frequency. Single or multiple small, localized and irregular white patches are seen on the oral mucosa. The patches appear to have a wrinkled surface. The lesion can also be thick, fissured or ulcerated. The color of the lesion varies from grayish-white to yellowish-white and reddish in case of presence of inflammation. The lesion is flat and non palpable. There pain and burning sensation on consumption of spicy food. The lesion is often present at the site where the tobacco users keep the tobacco dip (tobacco chewing). It occurs in individuals of above 40 years of age. Tobacco is the primary factor causing leukoplakia. Be it cigars, cigarettes, pipes or smokeless tobacco use, all are associated with leukoplakia and oral cancer development. In certain cases the lesions tend to regress after cessation of tobacco use. Vitamin deficiencies (vitamin A, vitamin B and folic acid). Chronic irritation to oral mucosa due to sharp tooth cusp or improper restorations also has the potential to cause leukoplakia. Viral infections such as herpes virus (HSV) and human papilloma virus (HPV) are associated with development of leukoplakia. Radiation exposure also causes significant risk of leukoplakia and oral cancer. Cessation of the tobacco usage and alcohol consumption is the first step in treatment or oral leukoplakia. 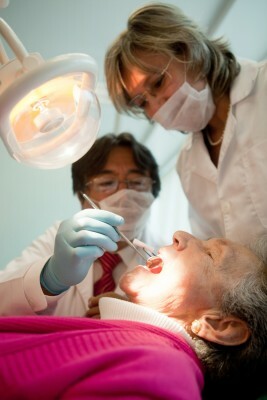 Further treatment depends upon the patient’s overall health and severity of the leukoplakia lesion. A biopsy of lesion is mandatory to determine its prognosis. Vitamin therapy is one of the first treatments to be carried out. Supplements of vitamin A .vitamin B complex, folic acid and vitamin E are prescribed. Small doses of beta carotene are also given as it helps in repair of the epithelial cells. Nystatin is prescribed in case of a fungal infection associated with leukoplakia. Estrogen therapy is also found to be useful in treating oral leukoplakia. If the lesion fails to regress after initial line of treatment, surgical intervention is necessary. The white patch and its surrounding mucosa can be surgically excised to prevent the lesion from developing into oral cancer. Newer methods alternative to surgery are cryosurgery and laser to remove the lesion.